Cross and Cutlass: Need Power over the Giants in your Life?! 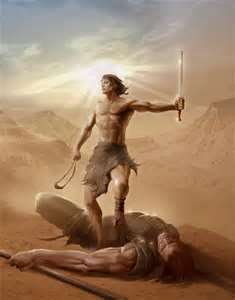 Need Power over the Giants in your Life?! Yet isn't that just like the enemy. He comes at us when we are weak and frightened and he starts taunting us. "You aren't good enough. You can't do this. Who do you think you are? You failed at xyz, you'll fail at this. You are unlikeable. You aren't strong enough. You aren't pretty enough. What makes you think God is going to answer your prayers? Your children won't be saved. Your marriage will fail...blaa...blaa...blaa" Okay.. sorry, got carried away there. Mainly because I've heard them all! And so have you, I bet. He called them servants of Saul over and over again for 40 days, until I think, they believed that's exactly what they were.. just servants of a lowly man. You see the enemy is desperate for us to think we are nothing. He wants us to believe we are just mortal and lowly and that there's really nothing we can do against him. How often have you said "I feel defeated. I'm being attacked. I'm depressed, worried, fearful. Who am I? I'm a nobody. What can I do?" You see, David knew something. He knew something deep within his heart that had been tested as he shepherded his father's sheep and fought off lions and bears. He knew that he, along with Israel, were in covenant with God. They were God's chosen people. That's why he called the Philistine "uncircimcised" That would be like us today calling someone a non-believer. David KNEW that when he stepped on that battlefield, he was not alone. He had the living God on his side. He had a deal with God. David would serve Him, and God would have his back.That's what covenant is. Just like marriage, it's a promise of protection, provision, love, loyalty and faithfulness. Yet aren't we just like the Israeli army most of the time? When the enemy attacks and bad things happen and life gets rough, we start trembling and believing all his lies about us, our lives and our families. When in truth, if we have believed in our heart that Jesus is the Son of God and confessed with our mouth that He is lord, we are in covenent with God. We are His chosen people. So, whereever we go and whatever we face, we have the backing of God and all His Holy angels. This should make the devil shake in his boots! And it does. Once we realize who we are! Why not try saying that to the enemy the next time he comes calling. Even better, why not truly believe it? Excellent post, once again !!! Oh, to have that -- power, belief, faith and trust in our hearts ... to know without a doubt, we have the backing of God and His holy angels ! As you said: "to realize 'who' we are" -- in Him ! So easy to get 'sucked in' and believe the lies of the enemy ... that we are -- useless, worthless, and unable to accomplish things. The battle is the Lord's ... best I try to remember that, daily ! Thanks again, for another timely Word in due season !!! Happy President's Day today -- America; and, in Canada -- it's "Family Day" ! Enjoy ! Yes, good word again! Thanks! This is a HUGE issue - believing the lies. Ick. 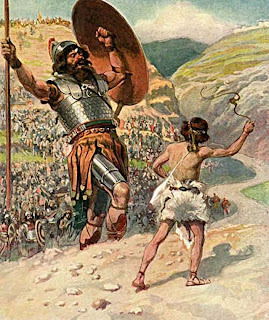 I'm victim to it as well, and long for that conviction, that faith, that strength and courage that David expressed when he faced Goliath. Wow. What a speech he gave him! And of course, it wasn't through his own power, but God's. He was a servant of God, not of Saul. Great story. Happy days to you ladies! :) Enjoying a somewhat lazy "Family Day" here in Canada! What a wonderful reminder that our Lord is our strength and our shield! Thank you, MaryLu. Thanks so much for reminding me yet again who is in control! 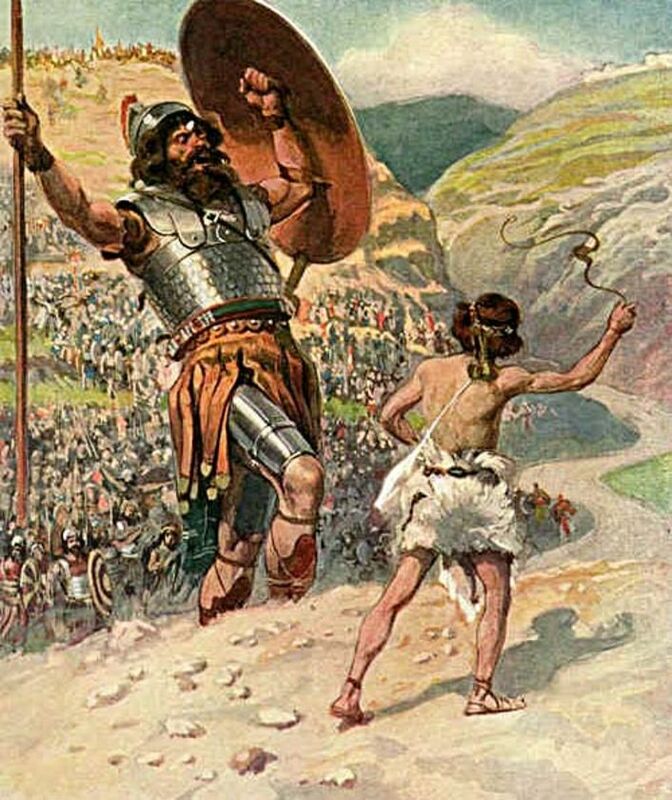 Anyway,I love the story of David and Goliath, but I'd never realized before how much confidence and faith David must have had not only in God but in God's covenant with Israel.. to step out and face a giant. We have that same covenant .. only better because we have God within us. Have a great evening! This post made me think of this quote by Martin Luther, "So when the devil throws your sins in your face and declares that you deserve death and hell, tell him this: 'I admit that I deserve death and hell, what of it? For I know One who suffered and made satisfaction on my behalf. His name is Jesus Christ, Son of God, and where He is there I shall be also!'" It is a statuatory holiday ... meant for "families" to get together -- enjoying good times, fun, and fellowship. Who knows MaryLu ... since it's a relatively new holiday .... maybe Canada just wanted to have a holiday on the same day the States do ... namely, your 'Presidents Day'. Hope you enjoyed "President's Day" yesterday. So true! We need to believe it BEFORE we say it or pray it. I tell that to my kids all the time. You must believe what you are praying about, otherwise you are just speaking into the wind. I know God hears every prayer, even those spoken by people who don't actually believe God hears them, but Oh what a smile it gives God to know that his loved ones believe He hears them! And satan will certainly flee faster if the rebuke is coming from someone who truly believes in the power of God. What a great article MARYLU!! Very well said. I could relate well with this as many times in the past, mostly because I simply didn't know better, I would proclaim victory over satan and his works etc; making bold declarations while still entertaining doubts. And not really grasping the truth and reality of God's power and love in my mind and in my life. Love it! Great reminder, MaryLu! We are made in the image of God and blessed with His gifts. God is for us. Who can stop us? May that very God bless you!